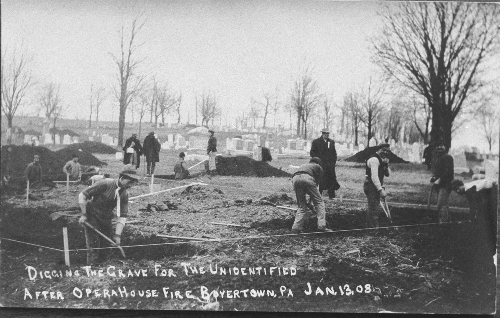 “Digging The Grave for the Unidentified,” Fairview Cemetery, Boyertown, PA, January, 1908. Flip to Memorial to “The Unidentified,” Fairview Cemetery, Boyertown, PA, circa 2008. On January 13, 1908, the Boyertown Opera House Fire killed 170 people, about one-tenth of Boyertown’s population. In the cold days that followed, 105 new graves were dug in the Fairview Cemetery.